Cancer, aging-related diseases and other illnesses are closely tied to an important enzyme called “telomerase.” UCLA researchers report in the journal Cell the deepest scientific understanding yet of this once-mysterious enzyme, whose catalytic core — where most of its activity occurs — can now be seen in near atomic resolution. According to a news release from UCLA, in addition to reporting the highest level of detail ever seen of the structure of telomerase’s catalytic corethe researchers report for the first time they have captured telomerase in the process of making DNA. 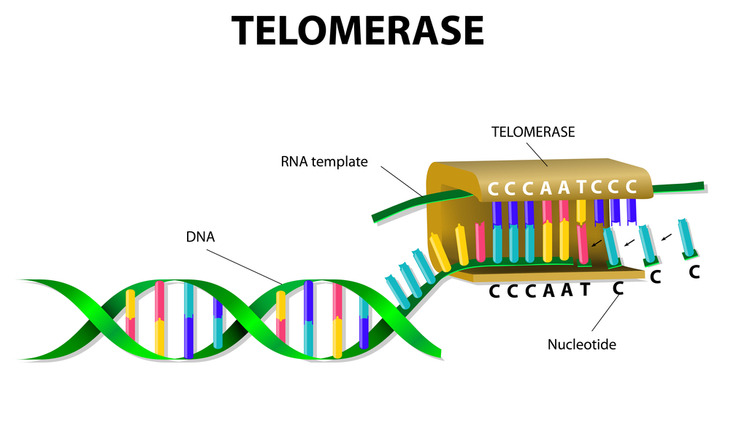 Telomerase’s main job is to maintain the DNA in telomeres, the structures at the ends of human chromosomes. When telomerase is not active, each time the cells divide, the telomeres get shorter. When that happens, the telomeres eventually become so short that the cells stop dividing or die. Cells with abnormally active telomerase can continually rebuild their protective chromosomal caps and won’t die, said Feigon, who also is a member of UCLA’s Molecular Biology Institute and an associate member of the UCLA-Department of Energy Institute of Genomics and Proteomics. Over time, this is harmful because DNA errors accumulate and damage cells. Telomerase is especially active in cancer cells, which enables cancer to grow and spread. Feigon’s research team conducted the study using single-celled microorganisms called “Tetrahymena thermophila,” which are commonly found in freshwater ponds. Telomerase’s components are relatively well-known in Tetrahymena, and it is the organism in which telomerase and telomeres were first discovered. The central catalytic core of telomerase is similar in all organisms, including humans. Telomerase contains a specialized “reverse transcriptase,” or class of proteins, that has four major regions and several sub-regions. In this research, the scientists have revealed a large, previously unstudied sub-region called “TRAP” in the enzyme’s reverse transcriptase. Instead of copying from DNA to RNA — typically DNA makes RNA, which makes proteins — reverse transcriptases use RNA to make DNA; one that’s especially well-known is the HIV reverse transcriptase, the target of many drugs. According to the news release, the researchers report for the first time the structure, shape and significance of TRAP, and the region with which it interacts. Feigon’s research team is learning how the regions interact and communicate with one another. In a 2015 study in the journal Science, Feigon and colleagues reported the location of a major region called “TEN.” Now the researchers report the structures of TEN and TRAP, and how they interact with each other and with the telomerase RNA. Many mutations that scientists attributed to the TEN region in fact disrupt TEN’s interaction with TRAP, the researchers report in Cell. What are the implications of the research for fighting cancers? Cancer cells keep reproducing, and for this to occur, telomerase must be highly active — which it is not in healthy cells. To reduce this, it would be useful to know how to target the enzyme’s activity. This new research brings this goal closer to reality by providing clues about what parts to target. The scientists used a technique called “cryo-electron microscopy” that enables them to see the enzyme in extraordinary detail, and used computational modeling to interpret their data.